Which browsers does the Tweet Button support? The Tweet Button is available in English, Japanese and Spanish with other languages coming soon. To specify the language for the Tweet Button use the lang property and set it to the two letter ISO-639-1 language code. For English either omit the lang property or use lang="en"
What are the dimensions of the Tweet Button and Share Box? Tweet Button without count: The Tweet Button is 55 pixels wide and 20 pixels high. Tweet Button with horizontal count: 110 pixels wide and 20 pixels high. The 110 pixel width is made up from 55 pixels for the button, 3 pixels for the space separating the count from the button and 52 pixels for the count itself. Tweet Button with vertical count: With a vertical count the combined dimensions are 55 pixels wide by 62 pixels high. The 62 pixel height is made up from 20 pixels for the button, 2 pixels for the space separating the count from the button and 40 pixels for the count itself. The share box is 550 pixels wide and 450 pixels high. Any browser frames or toolbars will be added to those dimensions. What happens if twitter.com has an error or is over capacity? The Tweet Button is hosted on a high performance content distribution network and is kept separate from twitter.com. This means if twitter.com goes down your site will not be affected and the button will still display. What will happen is when a user presses the Tweet Button the Share Box will fail to load and users will instead see a Twitter error page. Also, in some cases, the count may not be displayed. The Share Box will show two recommended accounts who the logged in user doesn’t already follow. By default the via user is shown first with the first related account shown afterwards. If the logged in user already follows the via user twitter will instead show the first two related accounts the user doesn’t already follow. There will be no recommended users displayed if the user follows all the suggested (via and related) accounts. How do I access the count API to find out how many Tweets my URL has had? My count doesn’t seem to be going up, is something wrong? To improve performance twitter caches the count before displaying it. The cache is updated frequently but on some occasions it may look like your count is not increasing while the cache is updated. 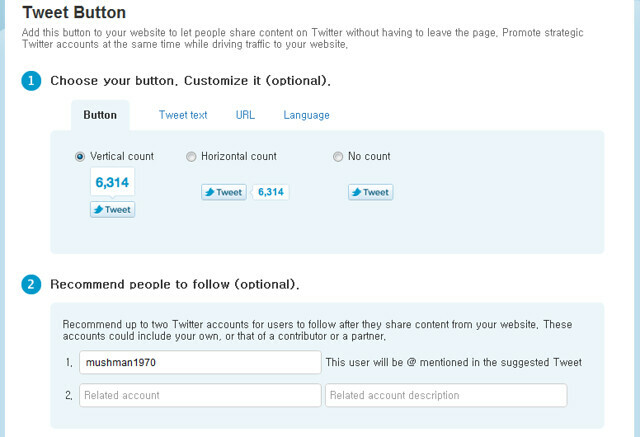 In addition, the count only includes public Tweets meaning a Tweet from a protected account will not cause an increase. When did Twitter start counting the links? Twitter started counting a couple of weeks before the launch of the Tweet Button. This means links which have been shared on Twitter before July 2010 will not contribute towards the count. However, all publicly Tweeted links since then have been counted and the Tweet Button will reflect that.